Today marks the one-year anniversary of the earthquake that devastated Haiti, killing thousands, displaced hundreds of thousands, and ushered in a sense of hopelessnes to the already impoverished nation. But, today one year later, the global rebuilding and outreach efforts continue. 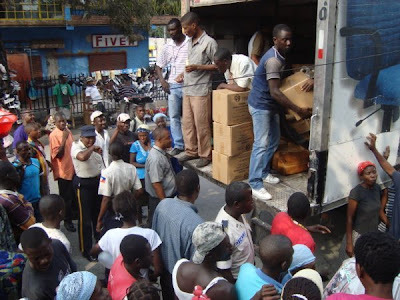 Photo: Distribution of Packaged Meals in Haiti sent from Washington State Offices. In December 2010, Children of the Nations (COTN) offcially announced that an official non-governmental organization (NGO) will be created in Haiti. This effort is being spearheaded by our country director in the Dominican Republic with the support of USA missionary Malou Faublas. Today, one year after the earthquake, the ministry of COTN continues.